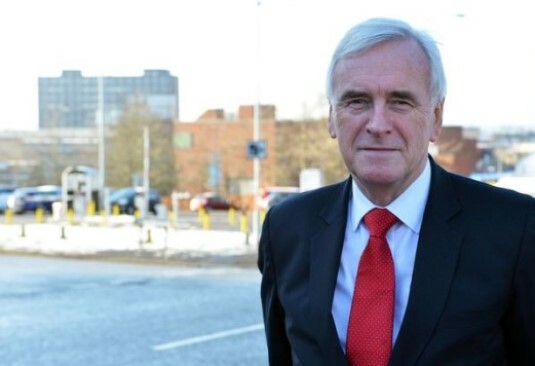 As part of John McDonnell's tour under the theme of Transform Your Town, he and the shadow treasury team came to Stoke to listen to what we think our local problems and priorities are, as well as talk about Labour's plan for Britain and what strategies we thought were useful for tackling the city's problems. About a hundred people squeezed in to the Hope Centre in Hanley for a series of talks and workshops on our programme for the city and the country. After Annalise Dodds kicked off proceedings, John pulled together some key stats about Stoke-on-Trent. The weekly wage in Stoke South constituency, which was originally going to host the event, currently stands at £478, as compared to the UK average of £550 and London's £650. 5.5% are registered unemployed, 10,435 people are in the process of being moved on to Universal Credit, 764 people have to cope with the bedroom tax, and 17,938 pensioners benefit from the protections afforded by the triple lock - a measure Labour is committed to keep. In the city as a whole, 30.4% children live in households in poverty and last year, Stoke's fifteen food banks gave out 111,946 supplies. Additionally, 13.8% of city households are classed as living in fuel poverty, and the City Council's spending power has fallen by 27.5%. Public services have similarly suffered. There are 129 unqualified teachers in Stoke's classrooms while 3,465 schoolchildren sit in classes of 30 or over. Staffordshire Police have lost 556 officers while robberies are up 27% and violent crime has increased seven per cent. 19% of patients in the Stoke Clinical Commissioning Group area have to wait more than a week to see a nurse or a GP, and overall public spending stands at £8,969/head - compared to £10,323 for London. Gareth Snell, our MP for Stoke Central, came next. He said that behind the numbers is a Tory attempt to tear at the social fabric that was built up by previous Labour governments and local authorities. Nationally the Tories take money from deprived communities, and locally the Tory-led council have cut services to the most vulnerable - homelessness services, and drugs and alcohol recovery - to fund their priorities. And yet, despite Stoke's problems, the city is rich in social capital. Despite the Tories undermining of city infrastructure and making a bad situation worse, communities have kept together and look out for each other, and beginning with Labour taking back control of the council in May both are a good basis from which to transform the city. Mark McDonald, Labour's prospective parliamentary candidate for Stoke South said that since he'd moved to the city, he was struck by the pride people had in the place and its heritage. But it was being neglected by its council. He noted the old Woolworth's in Longton and many other abandoned buildings in the town - an indictment of a city council (ironically) determined to coral all investment into the city centre. Encountering a young family at a local food bank, he talked about how the child's eyes lit up when he saw two shopping bags of food. We have to change things, which is why we need a new radical economic plan. Therefore he was proud of Jeremy Corbyn's and John McDonnell's work on this. The 2017 general election saw Labour's manifesto dominate the media and it shook the country up. The next would build on it. Lastly, local activist Becky Sergeant talked about the disengaged young people she met at work as a FE lecturer. They were alienated because sources of aspiration, inspiration and hope were lacking. Because of Stoke's industrial heritage, the old culture of it suiting local employers for young people not to do well at school has hung over. For example, of the 382 schools considered underperforming in terms of GCSE results, five of them are in Stoke-on-Trent. To turn this situation around, a culture of education needs a belief in something better. This means a campaign to bring schools back into local authority control, focus education by listening to communities and local businesses, and lastly listening to teachers - they're the professionals who know best. And this will provide a firmer foundation for a better economy. We then moved into our groups to discuss some of the problems confronting the city. Our table came up with something of a grim list - the obvious increase in homelessness in Stoke (and, sadly, our first (and hopefully only) death this winter), cuts to youth services, bedroom tax and universal credit, debt, the expansion of cashpoint charging, cuts to policing, internal transport - particularly the dysfunctioning bus service across North Staffordshire, and cuts to early years. In the feedback we had to pick one to talk to, so we chose youth services and young people. The kinds of problems we're seeing: despondency, a growing gang culture, these are part of a legacy of Tory/independent failure over closing youth services and redirecting funds into building a new Hilton Hotel and vanity projects. The Tory solution is to demolish the post-apocalyptic (literally) East-West shopping precinct and bus station and build a central youth facility there. An idiot move that not only replicates the huge YMCA complex a stone's throw away, but is a recipe for a battleground for the emergent rival gangs. Such is the political calibre of the city's Tory councillors. Other tables fed their challenges in too. These included addressing poor health, air quality and life expectancy, opportunities and graduate retention, the spread and geographic patterning of food banks, valuing all work and not fetishising received wisdom on "social mobility", underemployment, and addressing the mental health crisis. Presiding over the afternoon session, Lyn Brown introduced John on Labour's plan for Britain. On each of the tables, there were flyers branded John McDonnell: Strong Principles, Sound Economics. And this is definitely what we got. John's discussion opened with the plan for a National Investment Bank. This involves keeping the Royal Bank of Scotland in public ownership as the NIB's basis, and its responsibility would be overcoming the bias against the regions by working with networks of regional banks. It would be governed by a strategic investment board to guide productive investment, and overcome the tendency of existing productive industry of investing profits not back into innovation, but property and land speculation. Significantly, John was at pains to say Labour's programme wasn't a revisiting of nationalisations of the past. This was structural reform, and that means democratising services. The public ownership of water, energy, rail and the Royal Mail would mean experts, workers and consumers coming together. To embed democratisation further, the programme foresees a doubling of the cooperative sector (a target he thought was too modest) as a means of empowering workers and building long-term thinking into the economy. Co-ops, after all, tend to be less mercenary and short-termist than private business, particularly in the notoriously short-sighted culture of British capital. He also talked up the creation of a Ministry of Labour and the introduction of sectoral collective bargaining as a lever for redistributing wealth. Additionally, Labour was committed to a proper national living wage at £10/hour. Greater protections for private tenants and more social housing, with half of the million new homes to be built by a Labour government being council housing. There was a reiteration of the pledge to introduce free childcare for 2-4 year olds, and an industrial strategy that would look to grow high value production. This is inseparable from ambitious targets to draw 60% of energy from low carbon or renewable sources by 2030, and and immediate pledge to grown Research and Design to three per cent of GDP. This combined with sectoral industrial strategies, the creation of an ecosystem of policies supportive of business, the embedding of the National Education Service, and strategic use of government procurement would contribute to reversing off shoring. While this is exciting from the narrow standpoint of technocratic managerialism, this is very much a political programme. Each of the underpinning principles - economic justice, equality and diversity, and environmental sustainability throw down a gauntlet challenging existing vested interests, clusters of power, and piles of unearned wealth. For John, this represented a transformative programme that offers hope and a better future. In a number of ways, the damage the Tories have done has wound the clock back to pre-1945 levels of destitution and social dislocation. Summing up, he concluded that getting this programme through isn't a matter of electing Labour MPs and letting them get on with it - nodding towards efforts and democratising the party, he said that when we next get into government we all go into government. Ruth Smeeth as the MP for Stoke North put some local context to the plan, noting the situation the Tories have foisted on the city completely unacceptable. Last summer, the Holiday Hunger programme served 16,500 meals to schoolchildren. Regarding a luncheon club she helped set up, 176 people in her constituency turned up when she and volunteers were expecting "about 25". Money and economics in Stoke North means 31% of kids living in poverty, and foodbank use going up 46% since the introduction of universal credit. Efforts aimed at rolling this back begins with the return of a Labour council this May, she concluded. Unfortunately, I couldn't stay for the workshop session but overall this was much better than the usual talk/Q&A. With political education a perennial problem in all Labour parties, a focussed crowd sourcing of ideas like this in the framework of national policy (clearly explained!) made for an extremely useful event. The stats presented about Stoke, with increases in poverty, foodbanks, crime, homelessness, substance abuse etc etc sound like the worst predictions of Brexit! The point being that hard Brexit is already here in the form of Austerity, imposed while we were in the EU! If I was of a conspiratorial mind, which I am not, I would think the whole motive for a hard Brexit is actually to create a ready made excuse for our impending mass expropriation! And cover for the a rampage by the ruling classes, not on the dark savages but actually upon us. And who could complain because we voted Brexit right, and have only ourselves to blame! Brexit becomes Turkeys voting for christmas! But as I said, I am not conspiratorial! Boris Johnson can't be that devious can he? Only comment would be...As self-employed we have weeks where we earn £400 and have to juggle stuff around as we need buy material for jobs. But we never used a foodbank or other support as it's not possible for us to get any as they always judge on the yearly income but not on the actual facts of covering additional business costs. Unfortunately there is not much support for very small business owners.